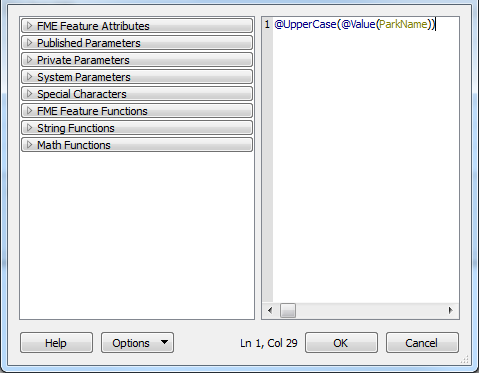 FME Feature Attributes - The exposed user attributes specific to the feature types of the data being transformed. The Advanced editor supports inserting extended ASCII printing characters and non-printing control characters. On Windows, these characters are inserted by holding the Alt key while typing the corresponding character code on the numeric keypad (usually on the right side of the keyboard; do not type the numbers that appear on the main part of the keyboard). On Macintosh, extended ASCII characters are inserted with a keystroke combination that includes the Opt key, or the Opt and Shift keys together. invalid parameters/attributes are shown in red. Select Font Opens the font dialog and changes the editor font. Find Finds the next instance of a string in the text. Find Next Finds the next instance of the string that was specified previously in the Find dialog. Replace Replaces the specified string with another string. Replace replaces only the text that is highlighted dark blue. Replace All replaces all instances of the highlighted text. Show Line Numbers When selected, shows the line numbers to the left of the text. This option is valid only if Syntax Highlighting specifies a programming language such as Python. When selected, shows brace matching. Matching braces on the left side of the text allow you to collapse the braced section so only the first line is in view. Show Spaces/Tabs When selected, shows a different character in the text for spaces, newlines and tabs. Word Wrap When selected, wraps lines that continue past the end of screen onto the next line. Otherwise, it keeps the line intact and shows a horizontal scroll bar. Switch To Basic Switches to the basic text editor. Available only when using the text editor with the StringConcatenator transformer. Sets Workbench to always show this editor. Available only when using the text editor with the StringConcatenator transformer. You can also set this option from the Tools > FME Options menu.